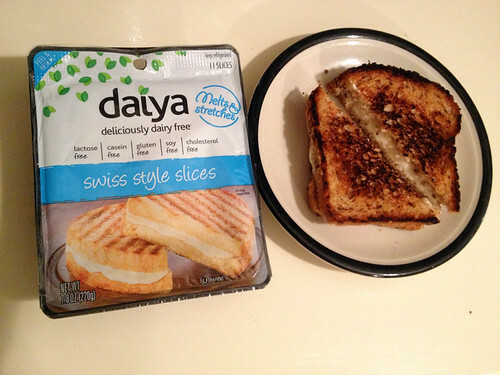 If you follow me on twitter, you've already heard this - but I am in LOVE with Daiya's new flavor of vegan cheese: swiss! I used to eat grilled swiss cheese sandwiches all the time - so when I decided to (mostly) stop eating dairy, that was one of the things I missed the most. I had the occasional grilled cheese sandwich made with vegan "cheddar" cheese, but it wasn't the same. So I was thrilled when I saw vegan SWISS cheese at the store! Of course it doesn't taste exactly like "real" swiss cheese. And the texture is quite different, as all vegan cheeses are. But still - it makes a delicious vegan grilled cheese sandwich! I buy Daiya at several little health food stores near my apartment, and I've seen Daiya products at Whole Foods as well. Look on their website to find out where they might be sold near you. Oooh, as addicted as I am to the shreds, I've only tried the provolone so far. Will look out for the Swiss!